1 B 92 Private, Wakle, Martin H 69 Infantry, Removed from Cumberland.
" C 101 " Ward, John E 91 " Sep. 10, 1864 Removed from Frederick.
" " 115 " Welsh, Patrick E 110 " Dec. 18, 1864 "
" " 118 " Wall, Clarence B 149 N. Guards, July 9, 1864 "
" " 125 " Walters, Jonathan I 144 " July 19, 1864 "
" " 127 " White, Madison F 91 Infantry, Aug. 16, 1864 "
" " 133 Corporal, White, Isaac M. I 160 N. Guards, July 7, 1864 "
" " 141 Private, Windon, Uriah B. I 36 Infantry, Apr. 19, 1865 "
" D 161 " Wagner, Joseph K 23 " Sep. 17, 1862 Removed from Antietam battle-field.
" " 165 " Weiner, John K 11 " Sep. 17, 1862 "
" " 167 " Wiswell, James H. H 8 " Nov. 22, 1862 "
" " 171 Corporal. West, Albert H 8 " Sep. 17, 1862 "
" " 195 Sergeant, Wolfe, Henry F. A 30 " Sep. 21, 1862 "
" " 201 Private, Went, Lewis Sep. 17, 1862 "
" " 206 " Westerman, George W. Nov. 27, 1862 Removed from Smoketown.
" E 234 Corporal, Whitney, Isaac N. Sep. 14, 1862 Removed from South Mountain.
" 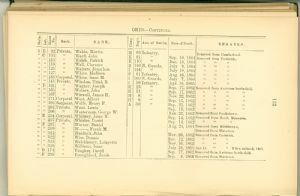 " 237 Private, Whisler, David Sep. 14, 1862 "
" " 299 " W -----, Frank M. Removed from Weverton.
" " 321 " Walduck, John Nov. 26, 1862 Removed from Frederick.
" " 322 " Wise, Dennis Dec. 12, 1862 "
" " 323 " Welchhouer, Lafayette Nov. 16, 1862 "
" " 328 " Williams, Isaac July 18, 1863 Age 21. " When enlisted, 1862.
" D 174 " Yongker, David Sep. 17, 1862 Removed from Antietam battle-field.
" F 295 " Youngblood, Jacob Sep. 4, 1864 Removed from Weverton.